These delicious taco bowls are easily customizable to fit your favorite taco toppings! 1. Cook ground chicken in a skillet over medium to medium-high heat until it is no longer pink and cooked thoroughly. Stir in taco seasoning and water as directed on seasoning packet instructions. 1. Assemble taco salads. 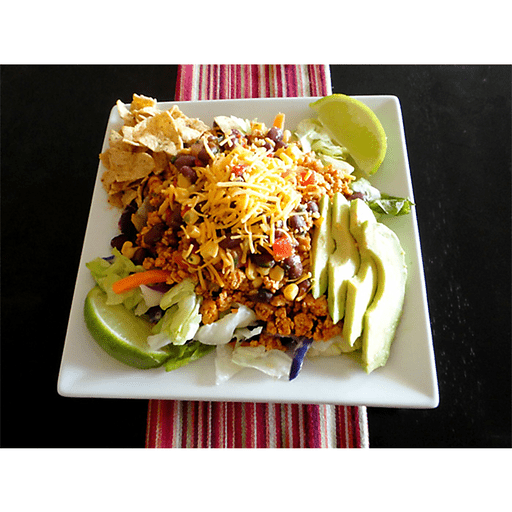 Set out 4 salad plates and layer evenly with ¼ of each of the ingredients: lettuce, seasoned ground chicken, black beans, avocado and shredded cheese. Top with tortilla chips, salsa, olives and a squeeze of fresh lime juice. Calories 380, Total Fat 17g(Saturated 5g, Trans 0g), Cholesterol 85mg, Sodium 960mg, Total Carbohydrate 25g (Dietary Fiber 9g, Sugars 7g), Protein 34g, Vitamin A 90%, Vitamin C 50%, Calcium 15%, Iron 10% *Nutritional values are an approximation. Actual nutritional values may vary due to preparation techniques, variations related to suppliers, regional and seasonal differences, or rounding.